List three benefits of forages to society. List three grasses that were brought into this country during the colonial period. List three organizations that promote research about forages and cooperation between those interested in forages. 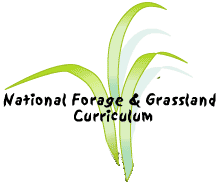 List three adjectives that contribute to a good definition of forages. Using the following list of products, make a graph illustrating the animal source of the sale items at a local market. Discuss how this market depends on forages for many of its sales. Sale items at "Budget Betty's" include: angora sweaters, cashmere scarves, leather belts, alligator purses, snakeskin boots, venison steaks, milkshakes, cheese puffs, ice cream, moose sausage and lamb chops. A lamb weighs 22 pounds at birth and weighs 110 pounds at weaning. What percentage of the weaning weight did the lamb weigh at birth and what percentage of weight was gained? An adult ram can eat about 3% of his body weight a day. If the ram weighs 220 pounds, what will he eat in one day? Write a short persuasive paragraph describing why forages should be more greatly appreciated by the general population.